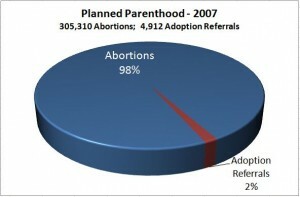 Per Planned Parenthood’s annual report, they performed 305,310 abortions in 2007, compared to 4,912 adoption referrals. HT: Mere Comments. It would seem that, in terms of being Pro-Choice, their act of choice is… abortion. Wow. I mean…wow. Thanks for helping spread this info around.